Join us March 23 for FIU LACC's and SCJ's annual symposium on Latin America and the Caribbean for journalists, scholars, on-the-ground experts, researchers and policy-makers. See you at 9a today. Seating is limited. Email LACCevent@fiu.edu with questions. Coffee, lunch, light snacks and refreshments provided. Beer, wine, soft drinks, and hors d'oevres served during the closing party, in the Panther Suite at 5p. Registration check-in will begin a couple hours before we begin opening remarks. Come early for some coffee, light nosh and networking. Welcoming remarks with CARTA Dean Brian Schriner and LACC Director Dr. Frank Mora. Dr. Alejandro Alvarado Bremer—Faculty Program Coordinator, Spanish-language Journalism Masters— will serve as the day-long Symposium Chair. The first two sessions will cover surveys, research, causes and consequences as well as public policy and regulations. SESSION 1. DEFINING THE PROBLEM. The afternoon sessions will cover the state of the modern newsroom as it relates to mobile media, plus lively discussions of use-cases, technologies, initiatives and innovations. Social hour, mini presentations with mentors and professionals as well as closing remarks. More details about MMCAspeed coming soon. Let us know if you have a project or problem you are interested in sharing. This panel will set the stage for the overall discussion: from the statistical analysis of the digital divide in the Americas to the new legal and political environment that the new communication technologies and news platforms are facing in countries such as Cuba, Haiti, Venezuela, and Ecuador. Our panelists will discuss the opportunities that the Internet has created for news endeavors, and the challenges they are encountering to reach their audiences. A strong discussion on market conditions and strategy implementation. Seasoned journalists will share their experience on how legacy media and entirely digital media are targeting a slippery audience. They’ll share their knowledge at the tactical level: new trends in storytelling, how to leverage social media platforms, and how to evolve and be ready before disruption. A conversation with the gurus of new mobile technologies. A discussion on the technologies and platforms that are changing the news media landscape, and the conditions that the new and existing projects should meet to become successful and sustainable news businesses. Once you arrive to campus, follow signs that say "MMCA17 LACC SCJ"
“Mobile Media Culture in the Americas” (MMCA) is the theme of the 34th edition of the annual Journalists & Editors Workshop on Latin America and the Caribbean to be held on March 23, 2017, at Florida International University’s Modesto A. Maidique Campus in Miami. It’s free and all are welcome; RSVP now to save your spot. Each year, FIU’s Kimberly Green Latin American and Caribbean Center and School of Communication + Journalism partner to provide a forum for journalists, scholars and policy-makers to discuss the social, economic and political issues facing the hemisphere. These conversations represent informed, interdisciplinary efforts toward enhancing and deepening news coverage, policy decision-making, and the general public’s understanding of the region. The workshop attracts some of the top experts on mobile technology in Latin America from the business, nonprofit, and academic worlds, as well as policy makers from both international organizations and Latin American and Caribbean governments. Participants will also include professional journalists, technology enthusiasts, and students from the fields of Journalism, Communication, Latin American and Caribbean Studies, Marketing, and Information Technology, among others. This year we’ll have a full day of interactive analysis of how information and communication technologies—specifically, mobile media—affect Latin American and Caribbean societies. How are mobile media bridging divides? Is that bridge strengthening democracy, social mobility, and economic equality and supporting growth and development? How has innovation changed the newsroom and news media landscape in Latin America and the Caribbean? What is being done to support enhanced journalistic coverage of our hemisphere? Follow #MMCA17 on Twitter, Instagram and Facebook. Find articles about the event on Medium. For this year's event, we are piloting a student newsroom experience to immerse undergraduate and graduate students in a digital media environment by providing hands-on experience during the full-day symposium. Six select student writers, photographers, editors and designers will produce content for a conference online publication before, during and after the event under the personal guidance of six to eight faculty and professional mentors. Mentors will work one-on-one with one or two students to help develop story ideas and advise on coverage production. Mentors will receive special event recognition. They also have a chance to pay it forward, shaping the skills of tomorrow’s leaders in digital journalism. FIU LACC was founded in 1979 to promote the study of Latin America and the Caribbean in Florida and throughout the U.S.
FIU's Department of Journalism and Broadcasting is internationally-known for preparing students to be outstanding journalists. Knight Foundation is a national foundation with strong local roots, and funds the FIU CARTA Knight Innovator in Residence position. This is a 9-month visiting faculty position based in CARTA’s School of Communication + Journalism (SCJ), currently filled by Miranda Mulligan. 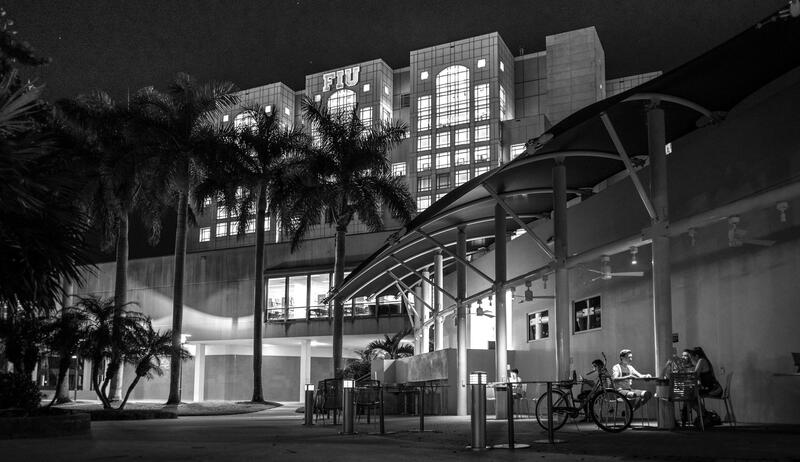 MALOKA is the Latin American and Caribbean studies graduate student organization at FIU. MALOKA supports MALACS graduate students professionally, academically, and socially. Promotion partner: Hacks/Hackers is a digital community of people who seek to inspire each other, share information (and code) and collaborate to invent the future of media and journalism. Promotion partner: NAHJ is dedicated to the recognition and professional advancement of Hispanics in the news industry. The student chapter is supplying the event volunteers and supporting the student newsroom experience. Have a project or problem that you are interested in sharing at our event? Fill out this form to be considered. Are you working on a mobile media project focused on Latin America and the Caribbean? Have you come across a problem that needs to be solved? Is there a dataset missing and you'd like to argue for more or better research? Tag your Tweets and Instagrams with #MMCA17 and share your vision for closing the digital divide with other workshop attendees!